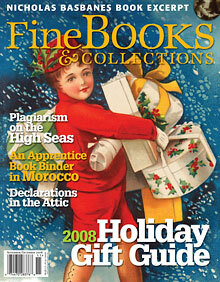 Compiled by Rebecca Rego Barry A baker’s dozen gift ideas for the collector who has everything. By Joan Druett An American family turns seafaring into a publishing dynasty. By Michael Greer An American teacher becomes an apprentice book binder. Excerpt by Nicholas Basbanes A World of Letters details the history of the Yale University Press from 1908–2008. A pair of DVDs offers the rare chance to watch a master book binder at work. Plus: Books received at the FB&C offices. By Nicholas Basbanes Tales from the UCLA library. By Derek Hayes Buying stolen maps. By Richard Goodman Art Colony Editions. By Joel Silver Treasures in the attic. Stephen M. Matyas, Jr., collector of early reprints of the Declaration of Independence.